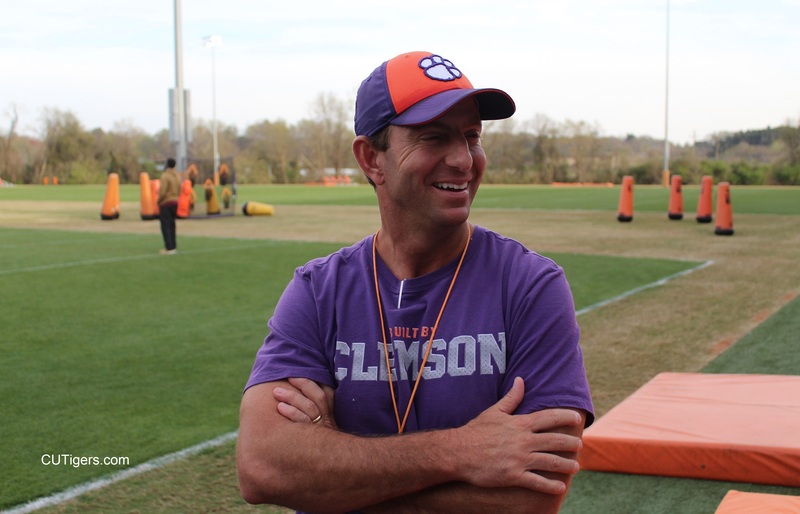 On Friday after practice, we spoke with Dabo for the first time since Monday. I asked him about the injury to Amari Rodgers and how it will affect the team going forward. Dabo said he thinks there is a very good chance Rodgers will be ready to play by September despite the ACL surgery he will undergo next week.. Derion Kendrick will presumably be the starter at Amari's position for the time being, and Diondre Overton has been getting snaps there as well. Kendrick has been playing both ways this spring at corner, and we have been hearing that he's very natural at the position. Kendrick is a versatile athlete who played QB in high school. Dabo said he loves Kendrick's willingness to play anywhere on the field, and I get the feeling that this recent development is not just a temporary fix for McMichael and Goodrich missing some practices with minor injuries. I wouldn't be surprised if we actually see Kendrick playing both ways next fall, depending on how much he is needed at WR with Amari Rodgers out. We saw Ray-Ray play a little corner late in the season in 2017, but that was more out of necessity. Finally, I had a nice conversation with Chase Brice. He talked a little about the Syracuse game and a few other topics, including the development of freshman QB Taisun Phommachanh.